Did publishers use the President of the United States as often as they use him these days? I know I've mentioned before about how Marvel (especially) will latch onto whatever is hot to sell more books (Wolverine, Venom, Deadpool, Squirrel Girl...), but latching on to the popularity of President Obama seems a little strange. Though Presidents have appeared in many books over the years, I wonder if the President was so often put into positions in which he played a key role in a comic book. There were several Thunderbolts comic books where President Obama was being attacked, some Siege comic books where President Obama is angry over the rogue nature of Norman Osborn, and now the most recent Captain America #611 where President Obama does not give Bucky Barnes for his crimes of the past. With media, the internet and imagery in general gaining a wider audience every day, the most powerful man in the country is one of the most recognizable men as well. I have to imagine that helps sell a comic book or any publication with images. Creating a connection to the potential buyer is important, and by using the President's mug Marvel is capitalizing on that fact. Heck, their President Obama/Amazing Spider-Man issue went into something like 6 printings. The man sells a book. 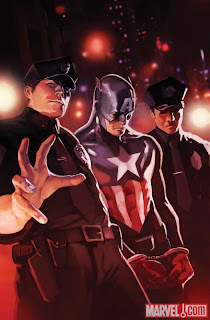 The comic of the day tries keep it real by installing the President into the story, but President Obama has such a strong presence that I am slightly distracted from Captain America #611's plot.